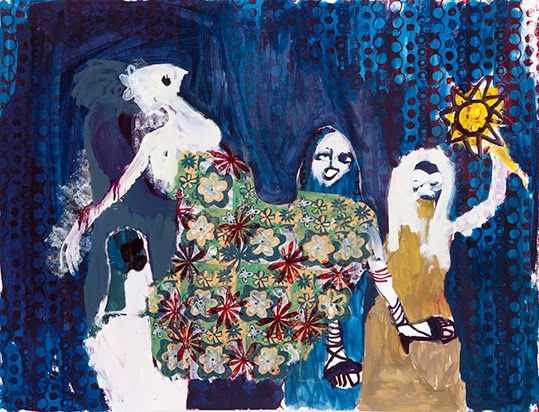 Tauya Naye (2013) by Portia Zvavahera (b. Juru, Zimbabwe, 1985) features in Mavambo Erwendo (Beginning of a Profound Journey), the artist's first show at Stevenson in Cape town, South Africa. Zvavahera's works display a profound understanding of colour and the language of Expressionism in a raw style of painting seldom seen in southern Africa. A distinctive aspect of her work is the integration of painterly mark-making with print-making in the form of textile-like patterns in her imagery. The show runs from 16 January - 22 February 2014.